“Boatman and Life”, a special meeting of boatmen on the Buriganga held at 10.30 am on 30 July 2016 at Kholamura Ghat of Kamrangirchar. Boatmen, living along the Kholamura Ghat area participated in the meeting that was organized by Buriganga Riverkeeper in association with Bangladesh Poribesh Andolon (BAPA), Nirapod Development Foundation, Swapner Siri, Green Mind Society and Riverine People. The speakers of the meeting gave importance to the protection of Buriganga River. Presided over by Sharif Jamil, Buriganga Riverkeeper and Joint Secretary of Bangladesh Poribesh andolon (BAPA), the meeting was addressed by Ibnul Sayed Rana, Chairman of Nirapod Development Foundation; Shekh Rokon, General Secretary of Riverine People; Amir Hossain, Executive Officer of Green Mind Society; Officer Ms. Lata and Executive Officer Ms. Salma Aktetr of Swapner Siri; Dr. Anwar Hossain, Human Rights worker; Jahangir Alam, Advisor of Nirapod Development Foundation and the boatmen of Kholamura Ghat. Mr. Sharif Jamil said that Dhaka had been founded about 400 years ago based on the river Buriganga. The riverine people are the actual keepers of the rivers. 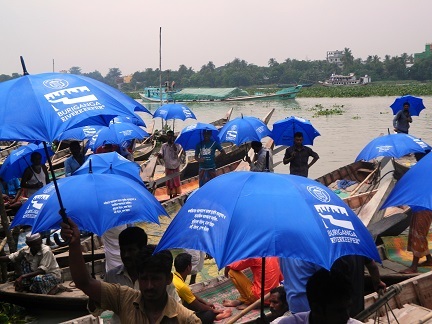 Rivers could be truly protected by the sincere efforts of boatmen. Everyone should join the efforts to protect rivers. Shekh Rokon, Secretary General of Riverine People said that every civilization on Earth had been established based on rivers. Boatmen joined the people of two sides of the river and flowed culture between them. Md Ibnul Sayed Rana, Chairman of Nirapod Development Foundation said that all encroachment and pollution would be stopped if the community people were aware of the facts. To improve the livelihood of boatman, to give education to their children and for healthcare they need help. A boatman could do his job if he is well which will bring affection to the boatman for the rivers. The Executive Officer of Swapner Siri, Ms. Salma Akter said that the life of a boatman was 100% river based. Rivers should be completely pollution-free. Among the Boatmen Amir Hossain, Ripon Manjhi, Solaiman Manjhi and others spoke and they explained their long life and memories around the Buriganga. It also revealed the ongoing mismanagements and detrimental activities to the river. They complained their health crisis in multiple ways that were all highly influenced by the current pollution from the textiles and tanneries. In the meeting, boatmen complained that one day the water of Buriganga River was used for household needs and other purposes but because of pollution now it is unsafe to use.